FARMINGTON - ArtsFarmington presents BUSTER KEATON in THE GENERAL, a silent comedy film with DOUG PROTSIK playing “OLD-TIME PIANO”; Saturday Feb. 9 at 7 p.m., Emery Community Arts Center, UMF, Farmington, Maine. Admission $10, but free for 18 and under, and for UMF students with ID. $5.00 for students from other colleges. No-one will be turned away. THE GENERAL will appeal to young and old! It was produced in 1926 and is regarded as Keaton’s best silent movie and the best train film ever, with splendid action and photography. It was inspired by the Great Locomotive Chase, a true event which took place in 1862 during the Civil War. and disappearance of his two loves : THE GENERAL and with it his fiancée Annabelle Lee (Marion Mack) who happens to be on the train! A series of daring, hilarious and romantic moments ensue, as expected in a Buster Keaton film. 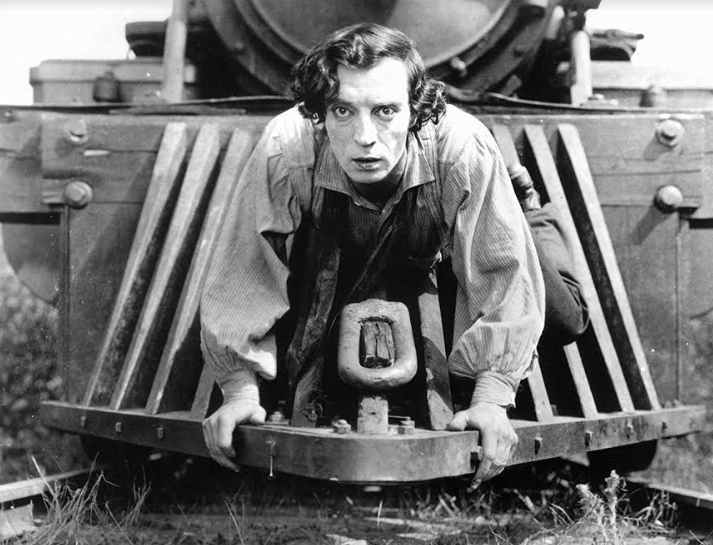 It should be noted that Buster Keaton himself performed the dangerous daring stunts during the chase! DOUG PROTSIK adds drama to the silent movie by his skillful piano accompaniment, as was common in the era of silent films. Doug is from Woolwich Maine, and likes to play old-time piano for dances, melodramas , honky-tonk saloons and silent movies and has a great interest in folk music. He plays with the Old Grey Goose band. He also plays accordion and fiddle. He has produced the CD: Old Time Country Dance Tunes and Songs from Maine. He is, and has been for many years, the director of the Maine Fiddle Camp.